Generator: Fischer Panda 12Kva with just 71 hours use. Batteries charged by shore power & generator via independent chargers one dedicated to domestic system and one to the propulsion batteries. Grey water tank 300L (grey water is filtered and reused for toilette flushing). Belt and braces black water system with both an ElectroScan black water sewage treatment plant (USCG type 1 approved) and a black water holding tank of 50L . An electric boat built in 2012 by Nautiner . GRP construction and fitted out to a high standard . Comfort and quality for a couple and guests. Owners aft cabin with island bed 2m x 1.4m en-suite shower & wc. Forward to galley starboard then up into wheelhouse saloon with dinette and inside helm. Forward again to guest cabin with island bed 2.1m x 1.4m and another en-suite shower & wc. Over 2m headroom. Central heating and quality finishings throughout. Aft deck with helm and seating for 6. Teak deck, swim platform, full canopy. All you need for comfortable cruising on coasts, rivers and canals. Register with Boatshed to see 64 extra photos of this NAUTINER 40 Ecological ELECTRIC BOAT Cat.C Nav. 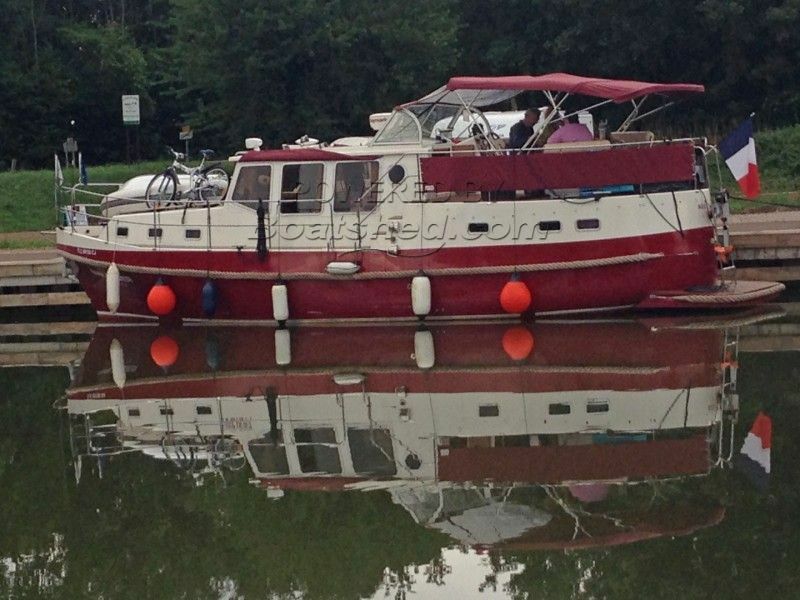 Electric powered motor cruiser for sale in Burgundy France. Boatshed Bourgogne is pleased to offer this Cat. C coastal certified electric motor cruiser for sale. An impressive vessel both for the quality and comfort of the accommodation and for the serious commitment to ecological cruising. Electric propulsion. Raritan ElectroScan sewage treatment system AND black water tank!! . Recycling of grey water onboard. Coastal cruiser, or canal cruiser go where you please in almost complete silence. It’s going to be a real pleasure to show you around this boat. Asking price included VAT (purchase tax) at 20% and this can be recovered by suitably qualified people or companies. For further information and appointments to view, please contact Graham WHARMBY, your Boatshed broker at Boatshed Midi Canals. This NAUTINER 40 Ecological ELECTRIC BOAT Cat.C Nav. has been personally photographed and viewed by Graham WHARMBY of Boatshed Midi Canals. Click here for contact details.